Constructing and executing distributed systems that can adapt to their operating context in order to sustain provided services and the service qualities are complex tasks. Managing adaptation of multiple, interacting services is particularly difficult since these services tend to be distributed across the system, interdependent and sometimes tangled with other services. Furthermore, the exponential growth of the number of potential system configurations derived from the variabilities of each service need to be handled. Current practices of writing low-level reconfiguration scripts as part of the system code to handle run time adaptation are both error prone and time consuming and make adaptive systems difficult to validate and evolve. 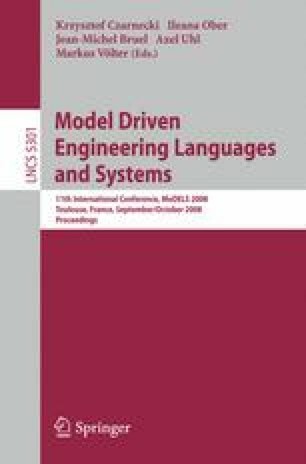 In this paper, we propose to combine model driven and aspect oriented techniques to better cope with the complexities of adaptive systems construction and execution, and to handle the problem of exponential growth of the number of possible configurations. Combining these techniques allows us to use high level domain abstractions, simplify the representation of variants and limit the problem pertaining to the combinatorial explosion of possible configurations. In our approach we also use models at runtime to generate the adaptation logic by comparing the current configuration of the system to a composed model representing the configuration we want to reach. This work was partially funded by the DiVA project (EU FP7 STREP).